An echocardiogram (also called an echo) is a type of ultrasound test that uses high-pitched sound waves that are sent through a device called a transducer. The device picks up echoes of the sound waves as they bounce off the different parts of your heart. This test helps to detect abnormalities of heart structure, valves, blood flow, heart function and in some situations (prenatal echo) abnormalities of the cardiac rhythm. 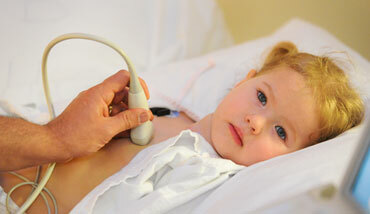 This test is performed in the office, completely painless and results will be immediately communicated to the family.